Professor Shah has received grant support from Biosense Webster, Boston Scientific and St Jude; advisory board and/or consultancy fees: Biosense Webster, Boston Scientific, St Jude, EP Technologies. Arrhythmia & Electrophysiology Review 2017;6(2):75–9. Katrina Mountfort of Medical Media Communications (Scientific) Ltd provided medical writing and editing support to the author, funded by Biosense Webster. Atrial fibrillation (AF) is the most common sustained cardiac arrhythmia, is associated with increased risk of stroke and heart failure and is a significant global health challenge.1 Pharmacological treatments to restore sinus rhythm in patients with AF are associated with a considerable relapse rate,2,3 whereas nonpharmacological interventions, such as catheter ablation procedures, which isolate the pulmonary veins (PV) from the left atrium and prevent AF initiation, are associated with long-term (≥3 years after ablation) success rates of up to 80 % with multiple procedures.4 Rates of ablation procedures have been steadily increasing over the last decade,5 but in order for catheter ablation to become first-line treatment for AF patients, there is a need for higher and reproducible single-procedure success rates with a substantially reduced procedure time. In order to achieve this, durable transmural and contiguous radiofrequency (RF) lesions are required in concert with standardisation of the ablation strategy. An important part of the challenge is determining whether sufficient RF energy has been delivered to the appropriate local tissue site: the most common cause of failure of catheter ablation or arrhythmia recurrence is electrical reconnection of the PVs following suboptimal energy delivery,6 while excessive energy can result in overheating, local injury, perforation, fistulae, steam pops and char.7,8 Contact force (CF) between the ablation catheter tip and the target tissue is a key determinant of the locally delivered RF energy. Although applicable to other arrhythmia substrates as well, this review will mainly consider the impact of CF on procedural success of AF ablation. Technologies are now clinically available that allow the direct measurement of CF between the catheter tip and the target myocardium in real-time, and two CF sensing catheters have received approval by the US Food and Drug Administration for use in AF ablation. The first catheter approved was the ThermoCool® SmartTouch (Biosense Webster) irrigated tip ablation catheter (February 2014) followed by the TactiCath Quartz (St. Jude Medical) CF ablation catheter (October 2014). A growing body of clinical data, both observational and larger studies, supports their use. The first published study of the use of CF ablation catheters in humans was the Touch+™ for Catheter Ablation (TOCCATA) study (n=77), which demonstrated that catheter ablation using real-time CF technology was safe for the treatment of supraventricular tachycardia and AF.14 In this study, a mean CF of 20 g or more correlated with an 80 % probability of AF freedom at 12-month follow-up. TOCCASTAR (Ablation Catheter Study for Atrial Fibrillation) was a prospective randomised noninferiority study that compared the TactiCath catheter with the Navistar Thermocool catheter (Biosense Webster) in patients undergoing catheter ablation of paroxysmal AF. 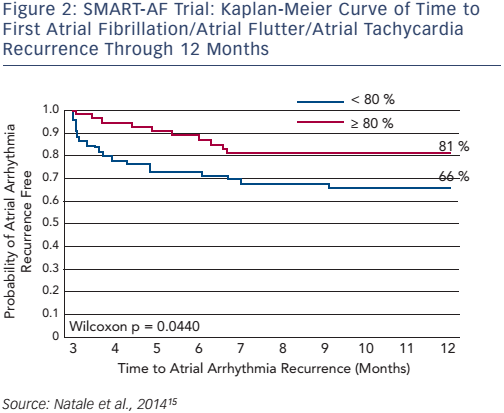 The 12-month freedom from AF/atrial flutter/atrial tachycardia recurrence was 68 %. A prespecified analysis of TOCCASTAR investigated the impact of CF in the TactiCath cohort. Of the 145 patients treated with the TactiCath catheter, 57 % received an optimal amount of contact (90 % lesions delivered at 10–40 g of CF) and experienced a chronic treatment success rate of 85.5 % versus 72.6 % for the suboptimal CF group (p=0.043).16 These results highlight the need to standardise operating procedures so as to routinely achieve optimal CF. An analysis of these and other data shows that successful PV isolation (PVI) is a function of transmurality, i.e. lesions extending through the entire thickness of the atrial wall as well as lesion continuity. Transmurality is affected by wall thickness, oedema and tissue composition, while contiguity, requiring the 3D localisation of the catheter, is affected by the lesion shape, interlesion gap and compensating for or evaluating electrode sliding. These are currently difficult parameters to measure. In this context, a varying optimal CF value has been suggested in different studies with, for example, Providencia et al. finding a mean CF <22 g indicative of poorer 12 month outcomes,17 whereas Stabile et al. found no difference in mean CF (13 ± 3.4 g versus 12 ± 4 g; p=0.32) between patients with and without arrhythmia recurrences.18 Whether these data indicate differences in tissue characteristics, RF power delivery, catheter tip stability or combinations of the above is unclear and prospective investigation using indices combining CF and other parameters (see below) may provide better results and greater safety. As increasing CF leads to higher tissue temperatures, excessive CF can lead to collateral damage related complications. Although most studies have shown similar or even fewer complications associated with the use of real-time CF sensing catheters compared with non-CF sensing catheters, these studies have all been relatively underpowered to detect small differences in complications. Excessive CF has been associated with perforation14 and tamponade,15 and perhaps atrioesophageal fistula, 19 thus underlining the importance of optimising CF. There are, however, other parameters beyond catheter tissue contact which are important in determining RF lesion size and contiguity. A multicentre European study compared PVI by CF-guided RF with second-generation cryoballoon (CB). The procedure time was lower for the CB group than for the CF group (109.6 ± 40 versus 122.5 ± 40.7 min; p=0.003), but fluoroscopy duration and X-ray exposure showed no statistical differences (p=0.1 and p=0.22, respectively). In addition, the overall complication rate was similar in the CB and CF groups (7.3 % versus 7.1 %; p=0.93).26 In another study comparing the two techniques, 56 consecutive patients underwent a repeat ablation due to recurrent atrial tachyarrhythmias after the index PVI achieved with CF ablation (30 patients) or CB ablation (26 patients). The percentage of reconnected PVs was significantly lower following CB procedures than with CF ablation (36.1 % PVs in the CF catheter ablation group, versus 20.4 % PVs in the secondgeneration CB ablation group; p=0.01).27 However, the mean CF perreconnected vein was lower compared with the persistently isolated PVs (10.9 ± 2.7 versus 18.6 ± 3.1 g; p<0.001), indicating the potential of further reduction in PV recurrence by achieving higher CFs. The same cannot be said of CB PVI since despite the finding that late PV reconnection was associated with warmer nadir temperature (-48.9 ± 5.1 versus -51.2 ± 4.7 °C; p=0.05), no specific measures are available to address this poorer cooling, and certainly none targeted to the specific area of conduction recovery. A study performed in seven UK centres randomised patients to ablation with (n=58) or without (n=59) CF data available to the operator. PVR was assessed with adenosine at 60 minutes and all the connections were re-isolated. In the group for which CF data was available, a reduction in acute PV reconnection rates was seen (22 % versus 32 %; p=0.03) but this did not translate to a significant difference in 1-year success rates (defined as off antiarrhythmic drugs) between the two groups (49 % versus 52 %; p=0.9).28 There may be a number of reasons for this. Firstly, the dormant PV conduction was ablated at 60 minutes, thus equalising the long-term outcomes between the two groups while the analysis was only performed with the initial ablation data. PV reconnection was assessed as dichotomic rather than number of gaps or segments with gaps and it is conceivable that non-CF guided PVs would have demonstrated more or wider gaps. In addition, the CF range was large, and it is unclear whether stable CF was assessed during ablation. It is evident that the ability to assess ablation lesion ‘quality’ during PVI would help in achieving better complete and stable lesions. Lesion assessment tools can help predict and localise electrical weak points, including actual or potential gaps with the potential of correcting these weak points with additional optimised RF energy delivery. Current diagnostic catheters allow the assessment of electrically active and conducting gaps, but provide no feedback on changes from ablation in the myocardial tissue itself and in particular lack information on whether the electrical changes – and by implication, tissue changes – are reversible or irreversible. Ideally, lesion assessment should provide information about dimensions including depth, diameter and also shape of the irreversibly necrosed tissue as well as of the zone of reversible thermal damage. Additional information of potential utility could include peak tissue and interface temperatures as well as electrogram or activation pattern changes. Direct real-time interrogation of tissue temperature could provide much of the above information but is currently not clinically achievable. Similarly, the ablation index (AI), based on integrating RF power, duration and CF, has also been proposed as a tool to assess the quality of ablation lesions. It too has been derived from a ventricular large animal RF lesion database. In a recent study,34 40 patients with paroxysmal AF underwent CF-guided PVI and the mean AI identified for each PV segment. The default power was 30 W: 25–30 W for the posterior wall and 30–35 W elsewhere. The CF ranged from 5–40 g and the RF duration from 20–40 seconds. At 2 months follow-up, late PVR was observed in 11 % of segments in 62 % of patients. The minimum AI (as well as FTI) was significantly lower in reconnected segments (308 versus 373; p<0.0001) compared with non-reconnected segments. Higher AI values were documented for anterior/roof segments than for posterior/inferior segments to prevent reconnection.34 This finding may reflect both local wall thickness differences as well as differences in catheter stability. Another small study including 42 patients undergoing PVI used an index (ALCI) derived from depth and contiguity parameters (including CF parameters: FTI, AI and interlesion distance) to predict the weakest spot in the ablation-isolation lesion and found that minimum ALCI, significantly lower in segments with PVR (74 % versus 104 %; p<0.001), was the most accurate in identifying sites of acute as well as late (at repeat ablation) PV reconduction.25 PVR sites were also characterised by a lower minimum AI (367 versus 408 arbitrary unit [au]), and a higher maximum ILD (inter-lesion distance; 6.8 versus 5.5 mm). These data highlight the need for precise and accurate lesion prediction, incorporating not only CF, power and time, but also tissue thickness, high-resolution electrograms, catheter tip orientation and stability with respect to the endocardium to ensure the creation of durable optimal ablation lesions. RF catheter ablation of AF has been considered a challenging procedure, but the availability of CF sensing technology allows real-time feedback of exactly how much CF is applied at any given moment, minimising the likelihood of applying too much as well of too little force. A growing body of evidence supports the use of CF sensing technology. Real-time CF information may help to create more predictable and reliable lesions and potentially improve both the safety and efficacy of RF ablation. Despite the absence of prospective randomised clinical studies with longer follow up, RF ablation guided by real-time CF sensing has become the dominant ablation modality, particularly for catheter ablation of AF.37–39 If however, the better acute outcomes with reduction in acute electrical PV re-connection shown in medium term studies,40 is borne out in studies with appropriate longer-term follow-up, then CF sensing technology has the potential to become the recommended standard of care for all patients undergoing AF catheter ablation. Camm AJ, Lip GY, De Caterina R, et al. 2012 focused update of the ESC Guidelines for the management of atrial fibrillation: an update of the 2010 ESC Guidelines for the management of atrial fibrillation. Eur Heart J 2012;33:2719–47. Roy D, Talajic M, Dorian P, et al. Amiodarone to prevent recurrence of atrial fibrillation. N Engl J Med 2000;342:913–20. Crijns HJ, Van Gelder IC, Van Gilst WH, et al. Serial antiarrhythmic drug treatment to maintain sinus rhythm after electrical cardioversion for chronic atrial fibrillation or atrial flutter. Am J Cardiol 1991;68:335–41. Ganesan AN, Shipp NJ, Brooks AG, et al. Long-term outcomes of catheter ablation of atrial fibrillation: a systematic review and meta-analysis. J Am Heart Assoc 2013;2:e004549. Cheema A, Dong J, Dalal D, et al. Incidence and time course of early recovery of pulmonary vein conduction after catheter ablation of atrial fibrillation. J Cardiovasc Electrophysiol 2007;18:387– 91. Bohnen M, Stevenson WG, Tedrow UB, et al. Incidence and predictors of major complications from contemporary catheter ablation to treat cardiac arrhythmias. Heart Rhythm 2011;8:1661–6. Panda NC, Cheung JW. Complications from catheter ablation of atrial fibrillation: impact of current and emerging ablation technologies. Curr Treat Options Cardiovasc Med 2014;16:344. Haines DE. Determinants of lesion size during radiofrequency catheter ablation: the role of electrode-tissue contact force and duration of energy delivery. J Cardiovasc Electrophysiol 1991;2:509–15. Avitall B, Mughal K, Hare J, et al. The effects of electrodetissue contact on radiofrequency lesion generation. Pacing Clin Electrophysiol 1997;20:2899–910. Shah DC, Leo G, Aebi N, et al. Evaluation of a new catheter sensor for real-time measurement of tissue contact. Heart Rhythm 2006;3:May suppl;S74. Yokoyama K, Nakagawa H, Shah DC, et al. Novel contact force sensor incorporated in irrigated radiofrequency ablation catheter predicts lesion size and incidence of steam pop and thrombus. Circ Arrhythm Electrophysiol 2008;1 :354–62. Shah DC, Lambert H, Nakagawa H, et al. 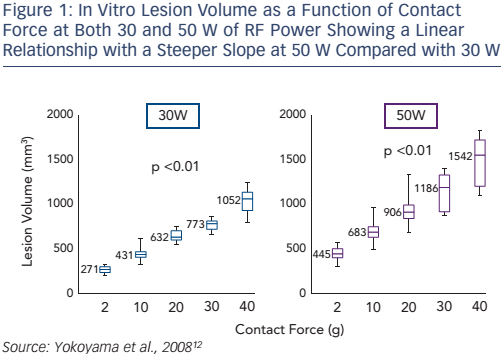 Area under the real-time contact force curve (force-time integral) predicts radiofrequency lesion size in an in vitro contractile model. J Cardiovasc Electrophysiol 2010;21 :1038–43. Natale A, Reddy VY, Monir G, et al. Paroxysmal AF catheter ablation with a contact force sensing catheter: results of the prospective, multicenter SMART-AF trial. J Am Coll Cardiol 2014;64:647–56. Reddy VY, Dukkipati SR, Neuzil P, et al. Randomized, controlled trial of the safety and effectiveness of a contact force-sensing irrigated catheter for ablation of paroxysmal atrial fibrillation: results of the TactiCath Contact Force Ablation Catheter Study for Atrial Fibrillation (TOCCASTAR) study. Circulation 2015;132:907–15. Providencia R, Marijon E, Combes S, et al. Higher contactforce values associated with better mid-term outcome of paroxysmal atrial fibrillation ablation using the SmartTouch catheter. Europace 2015;17:56–63. Stabile G, Solimene F, Calo L, et al. Catheter-tissue contact force values do not impact mid-term clinical outcome following pulmonary vein isolation in patients with paroxysmal atrial fibrillation. J Interv Card Electrophysiol 2015;42:21–6. Black-Maier E, Pokorney SD, Barnett AS, et al. Risk of atrioesophageal fistula formation with contact-force sensing catheters. Heart Rhythm 2017; [Epub ahead of print]. Sarkozy A, Shah D, Saenen J, et al. Contact force in atrial fibrillation: role of atrial rhythm and ventricular contractions: Co-Force Atrial Fibrillation Study. Circ Arrhythm Electrophysiol 2015;8:1342–50. Shah DC, Namdar M. Real-time contact force measurement: a key parameter for controlling lesion creation with radiofrequency energy. Circ Arrhythm Electrophysiol 2015;8:713–21. Iso K, Okumura Y, Watanabe I, et al. Wall thickness of the pulmonary vein-left atrial junction rather than electrical information as the major determinant of dormant conduction after contact force-guided pulmonary vein isolation. J Interv Card Electrophysiol 2016;46:325–33. Park CI, Lehrmann H, Keyl C, et al. Mechanisms of pulmonary vein reconnection after radiofrequency ablation of atrial fibrillation: the deterministic role of contact force and interlesion distance. J Cardiovasc Electrophysiol 2014;25:701–8. Nakamura K, Naito S, Sasaki T, et al. Predictors of chronic pulmonary vein reconnections after contact force-guided ablation: importance of completing electrical isolation with circumferential lines and creating sufficient ablation lesion densities. J Interv Card Electrophysiol 2016; [Epub ahead of print]. El Haddad M, Taghji P, Phlips T, et al. Determinants of acute and late pulmonary vein reconnection in contact force-guided pulmonary vein isolation: identifying the weakest link in the ablation chain. Circ Arrhythm Electrophysiol 2017;10:e004867. Squara F, Zhao A, Marijon E, et al. Comparison between radiofrequency with contact force-sensing and secondgeneration cryoballoon for paroxysmal atrial fibrillation catheter ablation: a multicentre European evaluation. Europace 2015;17:718–24. Ciconte G, Velagic V, Mugnai G, et al. Electrophysiological findings following pulmonary vein isolation using radiofrequency catheter guided by contact-force and second-generation cryoballoon: lessons from repeat ablation procedures. Europace 2016;18:71–7. Ullah W, McLean A, Tayebjee MH, et al. Randomized trial comparing pulmonary vein isolation using the SmartTouch catheter with or without real-time contact force data. Heart Rhythm 2016;13:1761–7. Linte CA, Camp JJ, Holmes DR, 3rd, et al. Toward modeling of radio-frequency ablation lesions for image-guided left atrial fibrillation therapy: model formulation and preliminary evaluation. Stud Health Technol Inform 2013;184:261–7. Neuzil P, Reddy VY, Kautzner J, et al. Electrical reconnection after pulmonary vein isolation is contingent on contact force during initial treatment: results from the EFFICAS I study. Circ Arrhythm Electrophysiol 2013;6:327–33. Reddy VY, Shah D, Kautzner J, et al. The relationship between contact force and clinical outcome during radiofrequency catheter ablation of atrial fibrillation in the TOCCATA study. Heart Rhythm 2012;9:1789–95. Kautzner J, Neuzil P, Lambert H, et al. EFFICAS II: optimization of catheter contact force improves outcome of pulmonary vein isolation for paroxysmal atrial fibrillation. Europace 2015;17:1229– 35. Neuzil P, Kuck K-H, Nakagawa H,et al. Lesion size index for prediction of reconnection risk following RF ablation for PVI. Heart Rhythm 2012;9:55:S492. Das M, Loveday JJ, Wynn GJ, et al. Ablation index, a novel marker of ablation lesion quality: prediction of pulmonary vein reconnection at repeat electrophysiology study and regional differences in target values. Europace 2016;19:775-83. Kumar S, Morton JB, Lee G, et al. High incidence of low catheter-tissue contact force at the cavotricuspid isthmus during catheter ablation of atrial flutter: implications for achieving isthmus block. J Cardiovasc Electrophysiol 2015;26:826– 31. Mizuno H, Vergara P, Maccabelli G, et al. Contact force monitoring for cardiac mapping in patients with ventricular tachycardia. J Cardiovasc Electrophysiol 2013;24:519–24. Afzal MR, Chatta J, Samanta A, et al. Use of contact force sensing technology during radiofrequency ablation reduces recurrence of atrial fibrillation: A systematic review and meta-analysis. Heart Rhythm 2015;12:1990–6. Shurrab M, Di Biase L, Briceno DF, et al. Impact of contact force technology on atrial fibrillation ablation: a metaanalysis. J Am Heart Assoc 2015;4:e002476. Hussein AA, Barakat AF, Saliba WI, et al. Persistent atrial fibrillation ablation with or without contact force sensing. J Cardiovasc Electrophysiol 2017;28:483–8. Zhou X, Lv W, Zhang W, et al. Impact of contact force technology on reducing the recurrence and major complications of atrial fibrillation ablation: A systematic review and meta-analysis. Anatol J Cardiol 2017;17:82–91.